Last year's tumultuous clashes in Charlottesville gripped the nation and became a flash point in a renewed discussion about the state of race relations in America. White nationalists and anti-fascist counter-protesters clashed violently, and video later showed that officers watched as people were beaten. A scathing independent report released in December found multiple failures by Charlottesville city officials and police. Now those in the city are looking back at the events of a year ago and commemorating civil rights activist Heather Heyer, 32, who was killed when James Alex Fields Jr. plowed through a crowd of counter-protesters. Two Virginia state troopers also died when their helicopter crashed as they helped monitor the scene. Susan Bro, Heyer's mother, told MSNBC she will put flowers on the street on Sunday to commemorate her daughter's memory. "Then I'm going to keep continuing with the work as I see fit — to move racial justice forward," she said. Events centered on peace and healing will take place in Charlottesville this weekend amid cordoned off downtown streets and significantly increased police presence. Meanwhile, the organizers of Unite the Right, the "white civil rights" rally at the epicenter of last year's violence, have moved this year's follow-up event to Washington, about 100 miles to the northeast. An organizer of the first Unite the Right rally wants to attract a few hundred people to a park near the White House while at least three counter-demonstrations will congregate elsewhere in the city — in hopes of drowning out their rhetoric. Upwards of 4,300 people could collectively descend on D.C., according to the permit applications filed to the National Park Service, including members of Black Lives Matter and Shut It Down D.C., a coalition of counter-protesters. Washington officials and law enforcement say they're bracing for a wave of demonstrations that have the potential to create chaos similar to what unfolded on Aug. 12, 2017. "Very, very few of our visitors share the views that will be expressed in Lafayette Park on Sunday," said Washington Mayor Muriel Bowser at a news conference Thursday with Metropolitan Police Chief Peter Newsham. "We have people coming to our city for the sole purpose of spewing hate. It didn't make sense last year, and it doesn't make sense now." 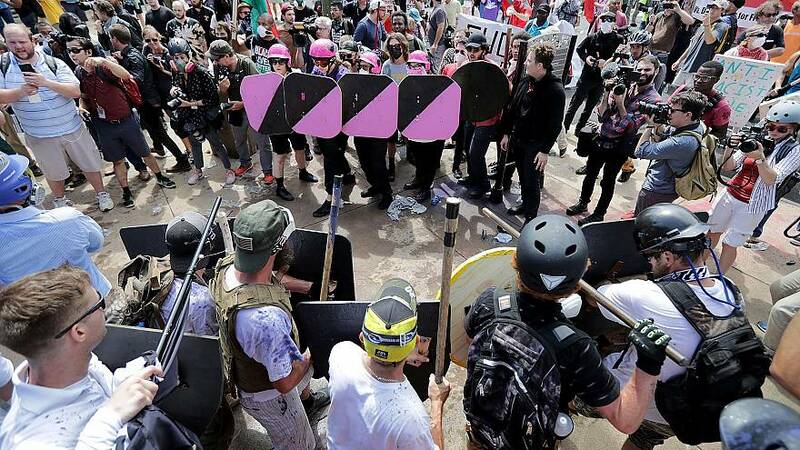 Newsham added that the goal will be to keep Unite the Right and the other groups separate to avoid a physical showdown, and ensure that "nobody gets injured and nothing gets broke." The law enforcement in D.C., including U.S. Park Police, are more than capable of handling a large crowd, said Richard Bennett, a criminal justice professor at American University in Washington. Police dealt with a massive demonstration during Inauguration Day in 2017, including protesters who flung bricks into windows and ignited trash fires. Bennett added that local laws also prohibit firearms from being within 1,000 feet of a demonstration — even if a legal gun owner has a concealed carry license — which will work in police's favor. "These people have demonstrated in the past that they're willing to engage in violence," Bennett said. "That's something that the district police have to keep in mind." Jason Kessler, who is again organizing this year's Unite the Right rally, said in his permit application that marchers at Lafayette Park will be carrying American or Confederate flags as well as body cameras. In Virginia, Gov. Ralph Northam and the city of Charlottesville declared a state of emergency ahead of Sunday's anniversary of the rally, which was initially conceived as a protest to the planned removal of a Confederate statue from a local park. About 1,000 police personnel are expected this year in Charlottesville — long known asa charming, liberal college town — while a lockdown is planned of the downtown. Pedestrians will only be allowed access through two checkpoints. Guns that are legally carried, however, won't be confiscated after the state legislature failed to pass a bill banning firearms at large public events. Kessler did not immediately respond to a request for comment, but told NPR in an interview Friday that his goal with a second Unite the Right rally is to "stand up" for free speech and criticizeanti-fascists, also known as Antifa, a loosely organized coalition of protesters, left-wing activists and self-described anarchists. Kessler also told NPR that neo-Nazis would not be welcome at his rally, although a permit filed with the National Park Service says that speakers on Sunday will include former KKK leader David Duke and Patrick Little, a documented Holocaust denier who is running as a GOP Senate candidate in California and was endorsed by Duke. In the days that followed last year's violence, President Donald Trump was heavily criticized for his lack of leadership, and stoked further outrage when he said "two sides" shared the blame for the race-fueled violence. On Saturday, he waded into the issue again, declaring on twitter that "We must all come together as a nation. I condemn all types of racism and acts of violence." While police will be out in force this year, the Unite the Right rally in Washington also likely won't be as energized if it lacks the amount of far-right groups who showed up previously. Keegan Hankes, a senior research analyst at the Southern Poverty Law Center, which tracks hate groups, said the white nationalist movement has become much more disorganized without the lack of any central leadership. He believes there will be a "tamer turnout" Sunday, in part because Kessler has lost support from other factions upset about the violence that erupted last year. In addition, some followers are spooked after their identities and personal information became widely shared on social media. Hankes added that while some far-right ideologues and white nationalists may no longer show up at events, they still remain emboldened online — particularly during a political climate that has divided people on issues involving immigrants, Muslims and other groups. 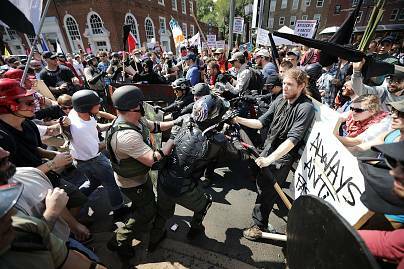 There are other lessons to be learned from Charlottesville, said Stanislav Vysotsky, a professor of sociology and criminology at the University of Wisconsin, who studies white supremacists and fascism. Hate groups have long festered within American society, he said, but Charlottesville proves that people are powerful if they come together to mobilize against them. He points to the turning tide in the city itself in the past year, which has seen its first black female mayor elected and installed its first black female police chief. Still, Charlottesville remains in limbo in one respect: The Confederate statue that was at the center of the first rally still stands. "What happened in Charlottesville is part of a larger movement," Vysotsky said, "but I don't know we've reached a tipping point that sweeps our culture and changes everything so drastically — yet."